Friday, April 19Delhi Greens Blog: Greening the World, One Post at a Time! 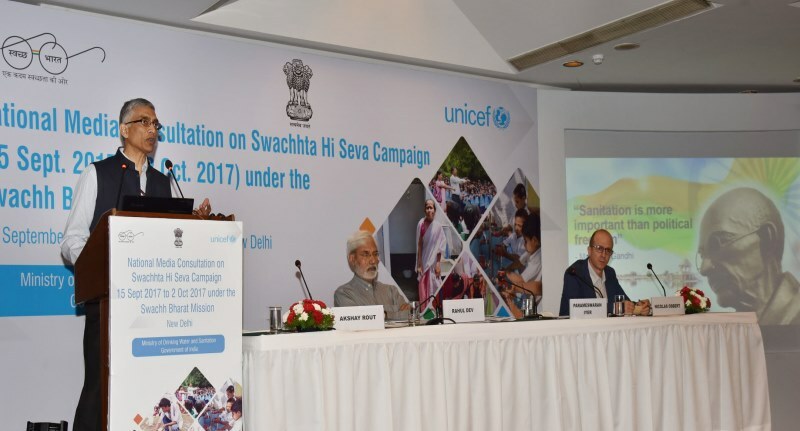 The Government of India recently organised a National Media Consultation on Swachh Bharat Mission in New Delhi. The Secretary, Ministry of Drinking Water and Sanitation, Shri Parameswaran Iyer, presided over the consultation. Shri Iyer shared details of the nation-wide mass mobilization drive, “Swachhata Hi Seva”, ahead of the 3rd anniversary of Swachh Bharat Mission on 2nd October 2017. Swachhata Hi Seva campaign is seeing large scale mobilization of people from all walks of life to undertake shramdaan for cleanliness and construction of toilets, and cleaning up of public and tourist places. The Secretary also shared a snapshot of the progress made by the Swachh Bharat Mission so far, mentioning that 5 States, nearly 200 districts and nearly 2.4 lakh villages across the country have already declared themselves as Open Defecation Free. It was also informed that independent survey shows a family saves Rs 50,000 a year by investing in a toilet, thereby assessing the the Return on Investment (ROI) in a toilet for a family to be 430%. This article has been written by a member of the Delhi Greens Blog's dedicated team of writers and researchers from across Delhi NCR, India and the world. The Delhi Greens Blog is a portal for green news, articles, events and activities and is at the forefront of the global and Indian environmental movement. Copyleft © 2008-2019. Some Rights Reserved. A Flagship Delhi Greens Project.